The holidays are coming up, and the calendar gods are truly smiling upon us this year! The new year holiday is nine days this year, and if you take just four vacation days you get a whopping 16 consecutive days off. Many people take this rare opportunity to travel abroad, and so will we. We will go to Sweden and my parents' for Christmas this year. It should be exciting for Ritsuko especially, as she's never celebrated Christmas in Sweden. It's not a religious holiday for us, but there should still be plenty of exotic customs and strange foods in her near future. We fly Thai airlines from Osaka to Stockholm, so we change flights in Bangkok, their major hub. Which means we will not return directly home after Christmas, but go to Krabi in southern Thailand over the New Year. A few days with Thai food and swimming in the sea at a warm summer resort is exactly what we'll need after the cold, wet December weather and all that heavy Christmas food. I'm sure we can squeeze in a cooking class or some excursion too. When you book early and all with the same airline you can stop at multiple places on the way, and side trips (such as Bangkok-Krabi) can often end up almost free. This is a good way to see new places if you have the time. Perhaps next time to Europe we could fly Air France and catch a weekend in Paris; or fly Emirates and visit Dubai for a couple of days. 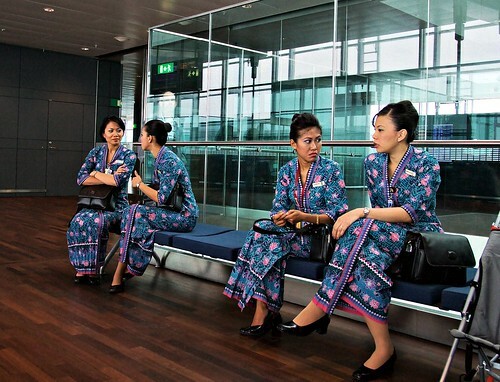 Malay Air flight attendants, Arlanda, Sweden. On the other hand, it's not the fastest route we could take between Osaka and Borlänge. Thai is a ways off, and we have a fairly long stop there on the way to Stockholm. When we leave our apartment it will take us 38 hours to arrive at my parents. Going via Helsinki would have cut it to no more than 25 hours or so. 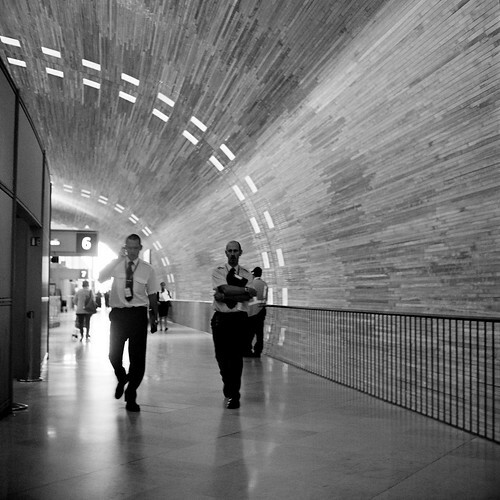 Security detail, Charles de Gaulle airport, France. The bags are packed, the gas is shut off and the Bonsamatic is filled up and running. We're off to the airport well before dawn tomorrow morning. Merry Christmas everyone! We're away on our winter holidays. We've had too much Christmas food, visited relatives, seen my new nephew for the first time, and met and old, old friend for the first time in many years. Now we're packing our bags again, as we'll get on the train to Stockholm before we leave for Thailand and the beaches of Ao Nang in Krabi. Meanwhile, here's a few shots I took earlier this year with my Mefag Handy Box. With no settings to worry about and no good way to see what you'll get, you can relax and have fun. 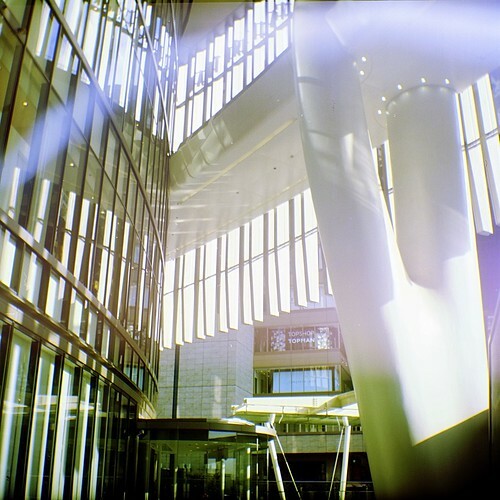 Grand Front Osaka is a new shopping center in Umeda. Lots of architecture but the same identical shops you find anywhere in the world. The flare, the colour cast and the bright reflection is all courtesy of the Handy Box. Who says you need an app to get cool effects? 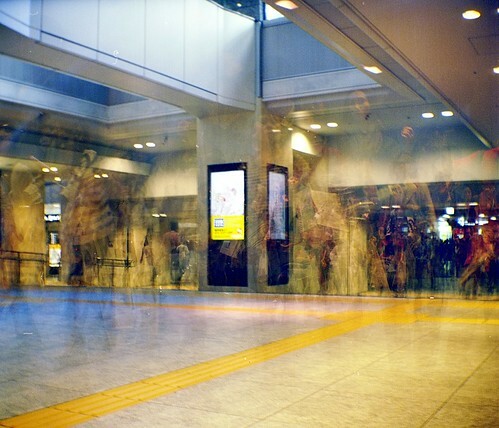 Busy ghosts in the Umeda underground. There's only a single shutter speed, but you can take shots in low light by exposing multiple times. As a bonus, everything that moves gets a ghostly appearance. 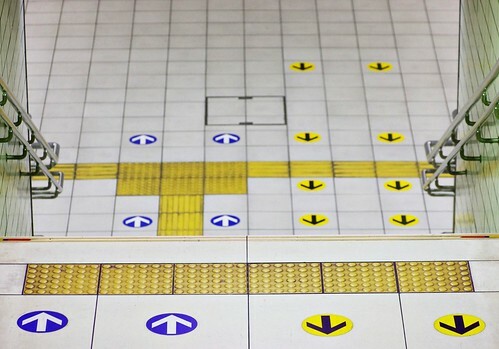 JR Umeda station. In good, indirect light the camera can take surprisingly accurate images. Filing past. Hit it with direct light and you are lucky to get anything at all from the uncoated single-element lens. Back again, after almost a week at OIST. It was very productive, despite a few unexpected issues¹. As good as teleconference systems have become, face-to-face meetings really are more effective. There is a lot of value in being able to just walk down the hall for a quick question or two. When I arrived I had a few hours in Naha before catching the bus to Onna village and OIST. And as luck would have it the weather was was a sunny, balmy 25°, so I took a walk through Naha, had ice cream and just enjoyed the rare December summer day. 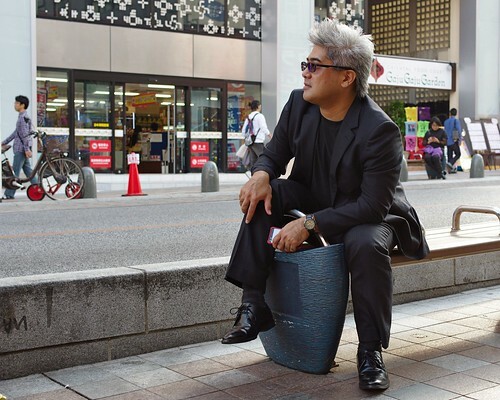 As I walked down Kokusai street, ice cream in hand, I happened upon this gentleman lounging on a bench and enjoying the pleasant weather. 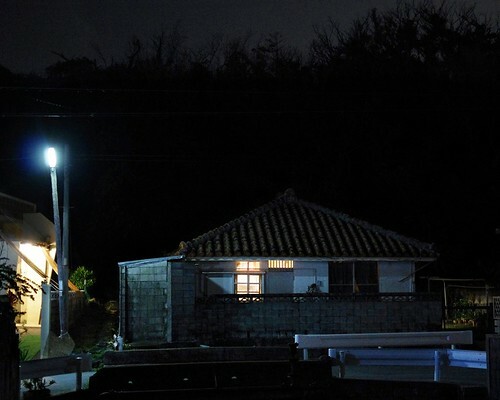 恩納村 — Onna "village" — is really a long, narrow region along the north-western coast of Okinawa island, and has several villages and settlements of various sizes. OIST itself sits on a hill-top overlooking the sea near Tancha. It's all pretty rural, with plenty of resort hotels but not a single business hotel in the area. The bus from Naha takes only a little over an hour, and costs about 1300 yen; not much different from my everyday commute in fact. The schedule is a little infrequent for commuting, though. 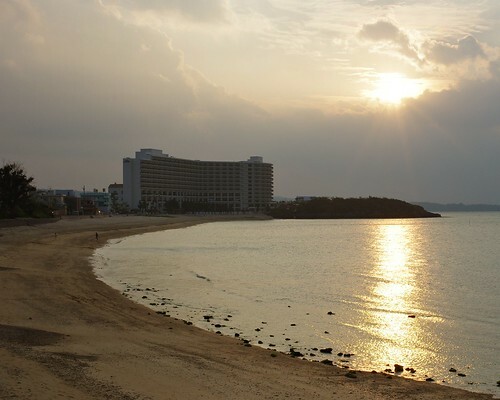 The seaside is one of the major attractions here, and even a mundane sunset feels amazing. 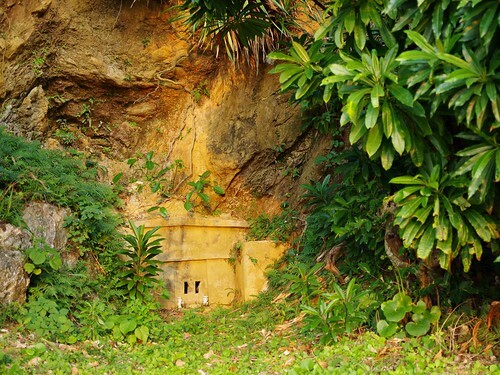 Okinawan grave, cut into the hillside. One aspect of Okinawan culture that is very different from mainland Japan. A residential house in Tancha. The place gets really dark — at least compared to Osaka. On the positive side, you can actually see the stars on clear nights. OIST has been around for some years by now, but the actual campus is still under construction. 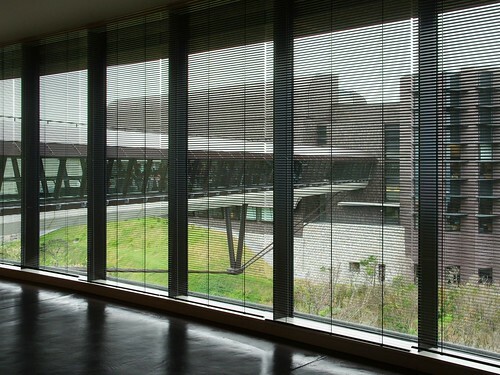 The architects seem to have made the most of the location, with buildings almost hanging over the hill-sides and with sweeping sea views from most offices and labs. it feels like you're perched on the edge of a towering cliff, even though it's actually on top of a gentle slope. 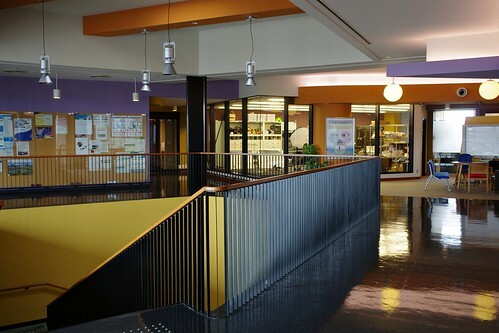 The stairwell and open hall at our department. Offices to the left, robot lab straight ahead. The wet labs are in another part of the building. Everything is quite open and spacious. 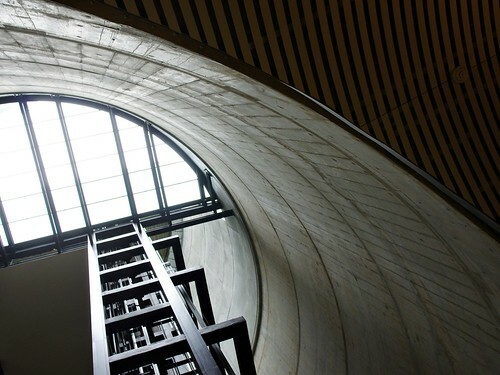 The open elevator shaft at the entrance to OIST. Most of the cost of building a place like this is used for things like infrastructure, load-bearing structures and so on. Good, bold design doesn't really add much to the total bill. Tourism is strongly seasonal here. The normal high season is summer of course. During the current low season many schools take advantage of the low hotel rates, so the airports are packed with grade and high school students going on school trips. And around February there's apparently a surge of graduating high-school and university students looking for some fun before they leave school. 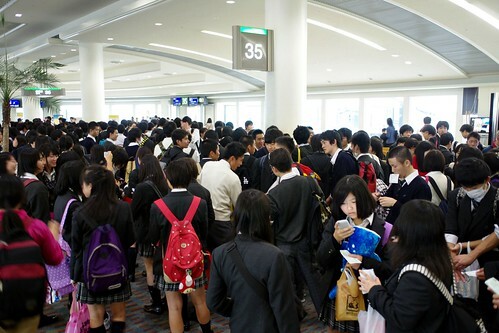 A horde of school students in uniform at Naha airport, all milling about and making noise as adolescents are wont to do. 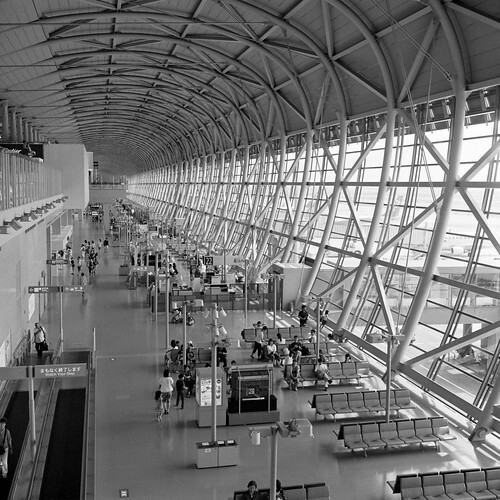 The airport was completely filled with them, as was Kansai airport when I was leaving for Okinawa. Low group fares and plenty of available rooms make this season a perfect time for school trips. 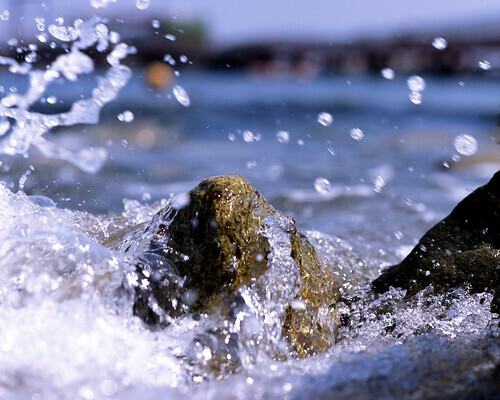 But Okinawa is not just sun and bathing. Many people enjoy Okinawan food, with its own dishes and ingredients. It tends to be heavier on meat — pork, especially — than mainland Japanese food, and often with the signature goya vegetable. Ever since the end of the world war, canned pork in the form of US Spam or Danish Tulip, has also become a common ingredient. Shige is a steak house just around the corner from Kafuu resort. Tasty and inexpensive, and the owner seems a nice guy. 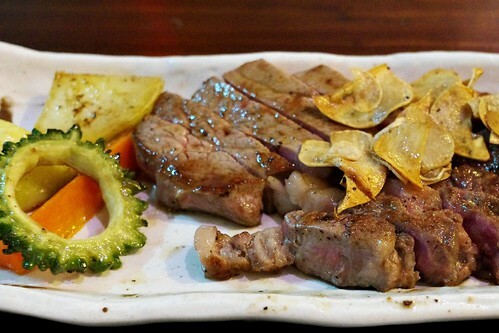 Meat, especially pork, seems much more common in Okinawa than in Japan in general. The green ring on the left is a slice of goya, by the way. Another Okinawan speciality is spam and eggs onigiri. I find the structure really interesting: with a normal onigiri you usually have the filling in the center of a closed rice ball, with the nori wrapped outside. 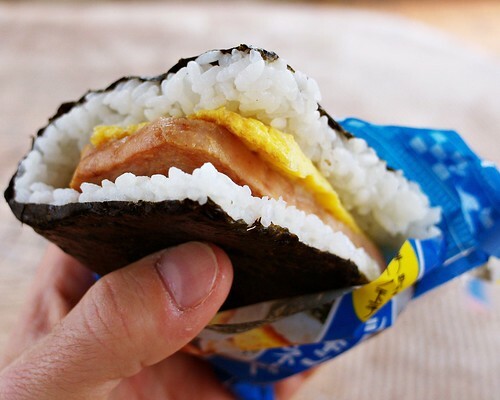 Here the rice has been spread onto the nori, then folded like a Mexican taco or kuwapao around the spam slice and fried egg. Really a great way to make it. #1 Pro-tip: if you plan to use a certain system, do check ahead of time that the system will actually be available for use. I'm on my way to Okinawa and OIST where I'll spend a few days working with the other people in my group. Internet meetings have been surprisingly effective, but sometimes you do need to sit down face to face and work directly with each other. 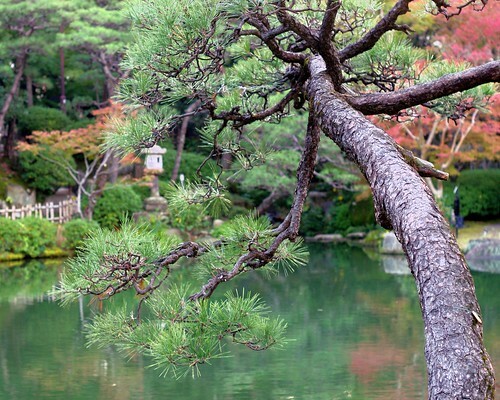 Meanwhile, here a few autumn pictures from the Sorakuen Garden in Kobe. I had no idea this place even existed, and we only stumbled onto it while on our way to dinner recently. It's a small oasis of peace and quiet close to the city center. Well worth the small admission fee to get away from the noise and bustle for a little while. Autumn is here. My favourite time of year — yes, really. I like the sense of melancholy and quiet. I don't even mind the rain. The Sorakuen garden pond. All the city noise outside is muted, and the garden turns mysterious and otherworldly at dusk. 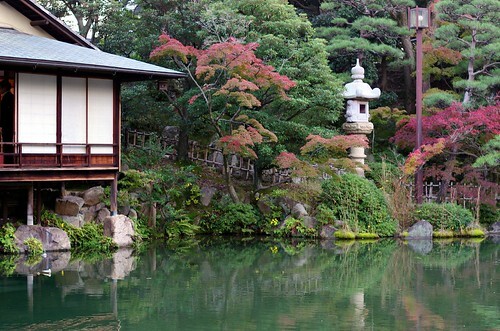 The pond and a small tea house. 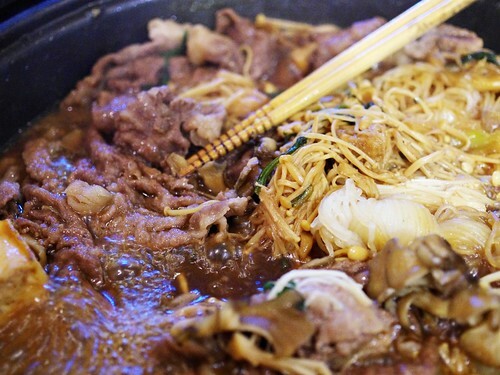 Sukiyaki is perfect winter food when it's cold and wet outside. You simmer sliced beef and vegetables in a hot pot, then dip the slices in beaten egg in your own bowl as you eat. It's simple to prepare, tastes great and works nicely for groups. This was at a dinner party by one of our relatives. As you may have noticed, I have turned off the Google+ integration of blog comments here on this blog. The initial idea was good: bring together comments on posts here, and comments on G+ into one single thread. That way it didn't matter where people came to read this stuff, they'd all see all the comments. Having to register was frankly a small bonus to me; I used to spend a fair amount of time just removing spam around here. However, it didn't really work out that way. In practice, comments were still split up; G+ posts had their own thread, while comments posted from here showed up in another. People still didn't see all comments made, and that rather defeated the original purpose. Worse, if commenters here chose an option not to have their posts appear on G+ — most did, and it was sensible, all things considered — then not only did they not show up on G+, I didn't get any notification of any kind that anyone had posted a comment. Also, I got feedback from a few people that they were commenting less or not at all because of this change. So, from last week I've reverted this change. Comments are once again local to this blog only. Much better for everyone, I think. There is one change: I do require all commenters to log in now; with a Google account, or through Open ID. I'm sick and tired of spam, and it has been a tremendous relief not to have to deal with it on a daily basis any longer. Note that while anonymous comments are no more, you can still be pseudonymous. Make a throwaway account on Yahoo or wherever, and use OpenID to log in if you want. It's not a big hurdle, and it does keep a lot of the spam away. 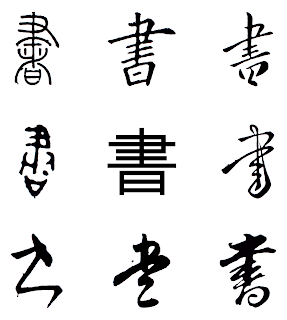 Another year, another attempt at the JLPT — Japanese Language Proficiency Test — Level N1. As always, it's held on the first Sunday in December. JR Tenmangu station, Osaka, on my way to Daito and Osaka Sangyo university. Two things hit me this year. First, I often seem to have luck with the weather. I can remember only one single time it rained; all other years it's been beautiful autumn/winter weather with clear, high skies, autumn leaves and that fresh bite of cold in the air. 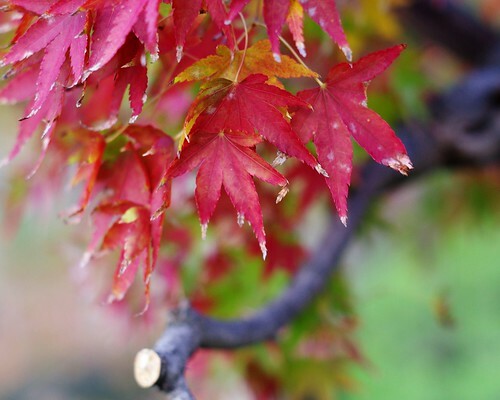 It's a good time of year here in Kansai. 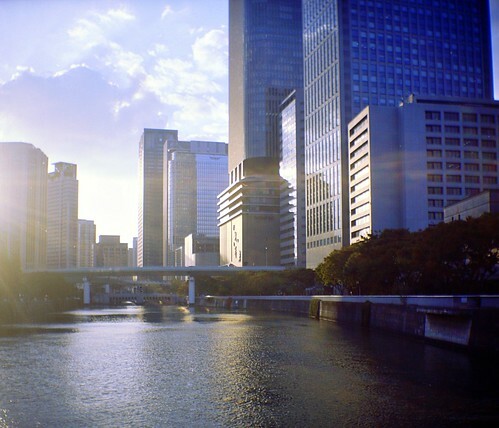 Daito, Osaka. Seems like a good place to live. Suminodo station, Daito, Osaka. I can imagine the flash floods from the mountains can be quite interesting around spring. Second, as far as I can remember I have always been assigned a seat on the left hand edge of a table. Never once in the middle (when there is a middle seat) and never on the right hand side. After eight tests (or is it nine now? ), it's really fairly improbable — the odds are around 1 in 850 — to happen by chance¹. Of course, the chance for it to happen to me is small, but with hundreds of thousands of test takers in a year and five levels to take, thousands of people take the test multiple times, so it's all but certain that it happens to someone. So it's unexpected, but not at all strange; there's no need to find an explanation other than random chance. 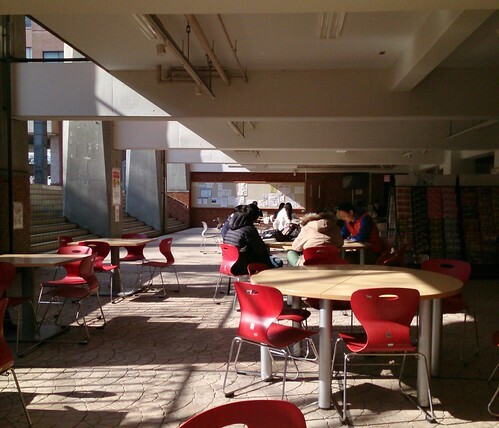 Outside atrium at Osaka Sangyo University, and people are waiting to get inside and start the test. The weather was just perfect, and the area was really a lot warmer and cozier than it looks like here. This one is taken with the Xperia Tablet Z, by the way; camera quality is not unimportant of course, but a good camera is not necessary (nor is it sufficient) for a decent picture. The test itself? Well... 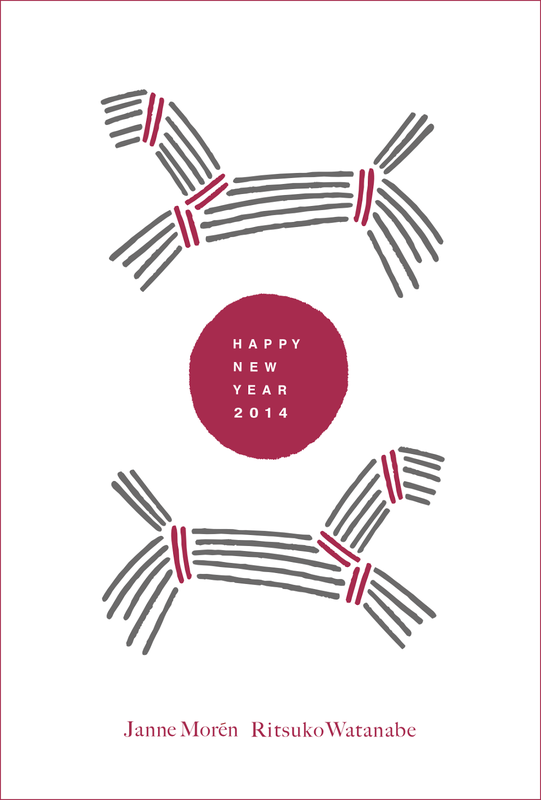 The good news is that it did feel a bit easier than last year. The listening, especially, was fairly comprehensible to me; most of my problems were really more of the "which answer fits the situation better? ", or "I lost focus and missed the beginning" kind, not "I don't understand what they're saying". I guess weekly meetings in Japanese, over a noisy low-fi internet connection, has really paid off. The bad news: I got the ending time wrong by ten minutes for the first half, so I had to leave the last reading questions altogether, and just blindly mark something. The reading questions at the end account for a large part of the score so this is going to hurt me badly. I expect a score somewhere in the 80's point range, and I really need to have improved to manage a score in the mid-90's again. On a positive note, I can see this as a build-up year, with more time to finish up the kanji and the N1 grammar, and I'll have an excuse for an autumn day-trip like this again next year. I will return, apparently. All the signs point to that. #1 1 in 864, if I assume three sites had middle seats, and the other five had only end seats. Small pieces of structural plastic have been showing up in the washing machine filter lately. And now it's started to make expensive-sounding noises when it runs. It's already eight years old, and will need to be replaced rather than repaired. I guess it's time to spend some quality time in the serene quiet and zen-like stillness of the Yodobashi Camera appliance department. And some quality money. It's interesting, by the way, how I've just taken a thing like this for granted. We're able to wash our clothes at any time, from dirty to clean in an hour, without effort, and never even thought about it. But now that we can't rely on this working, it feels like a small part of our safety net is yanked away from under our feet. 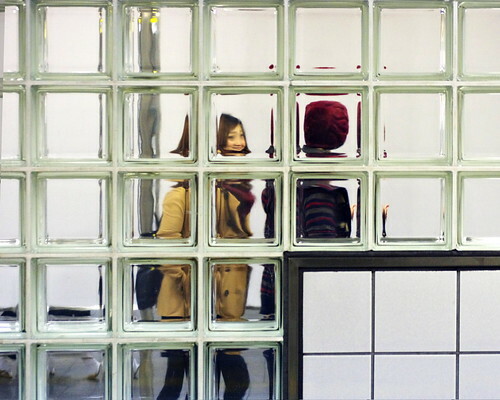 Our effortless life style is really composed of many, many puzzle pieces like that washing machine; ignored and invisible, but a lot more complicated and fragile than we think. It's good to be reminded of that from time to time. 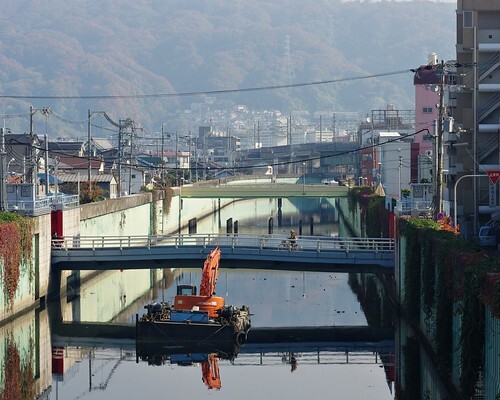 Summer day in Suma, east of Kobe. A reminder of a happier time. A time of warmth and sun and joy. A time when the washing machine still worked. OK, I'll stop complaining now. 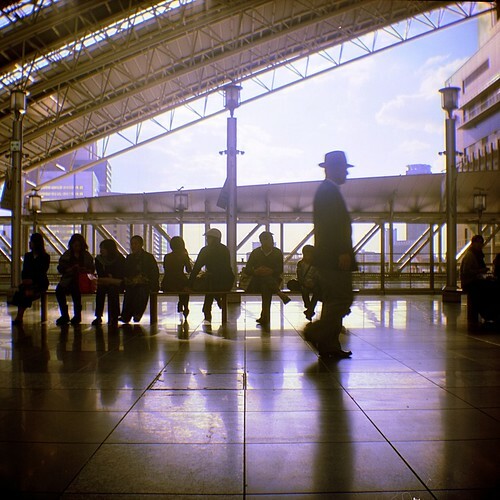 On the 7th of November 2003 — ten years ago today — I arrived at Narita, bag in hand, for a one-year research project at a lab in south Kyoto. The idea was to do a small project, return to Sweden, then look for work. Things did not turn out according to plan. To the left we're at a restaurant in Kobe in the summer of 2004. To the right we're having coffee in Hanoi in autumn 2013. Both pictures by Ritsuko. A lot of things can change in ten years. When I came here I was 34 years old, single and staying in a one-room short-term rental unit out in nowhere. Now I'm 44, married to Ritsuko, and we're living in a spacious apartment in central Osaka. I came to Japan holding a six-month Cultural Activities visa — the researcher visa application was late, so the embassy in Stockholm issued this to let me leave for Japan in time. Of course, calling robotics research "cultural activities" was probably stretching the rules well past their breaking point. Now I have a permanent residency permit that doesn't expire and lets me do almost any work I'd like. 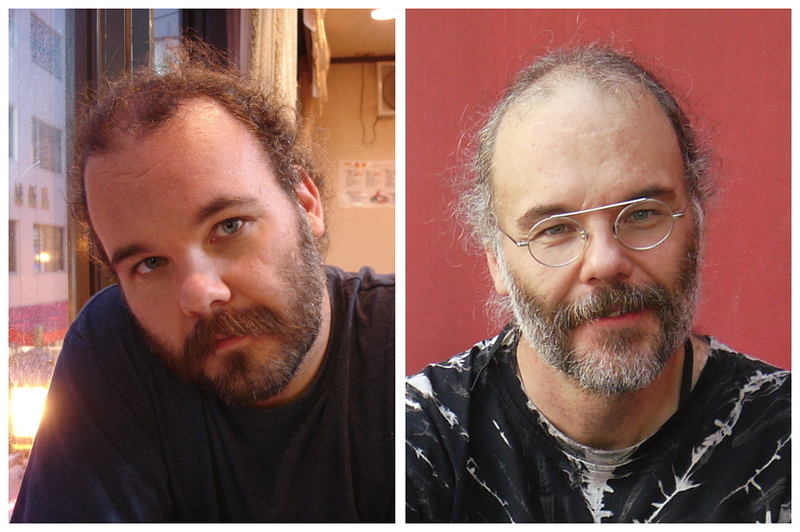 At 34 I weighed about 90kg, had a dark beard and a receding hairline. Now I weigh 68kg, the beard is turning white, and my hairline is nowhere to be seen. 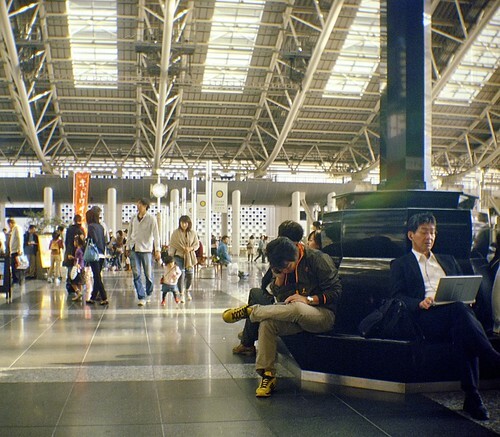 When I stepped off the plane at Narita in 2003, I didn't know more than a few words of Japanese. Today I can read newspapers and novels with some effort, and I can make myself understood in most situations. My first job here was a project-based post-doc on a yearly contract. Ten years on, my current job is ...well, a project-based post-doc on a yearly contract. So not everything changes, I guess. The next ten years? 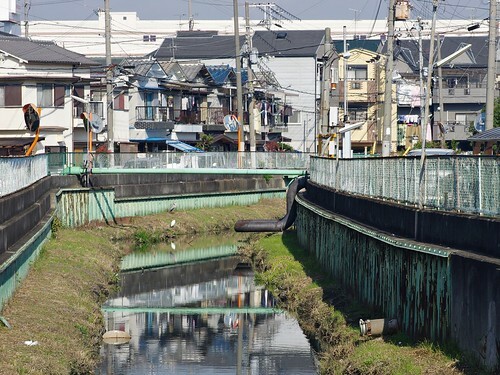 You never know of course — I wouldn't have guessed at my current life ten years ago — but I think we'll still live in Osaka. 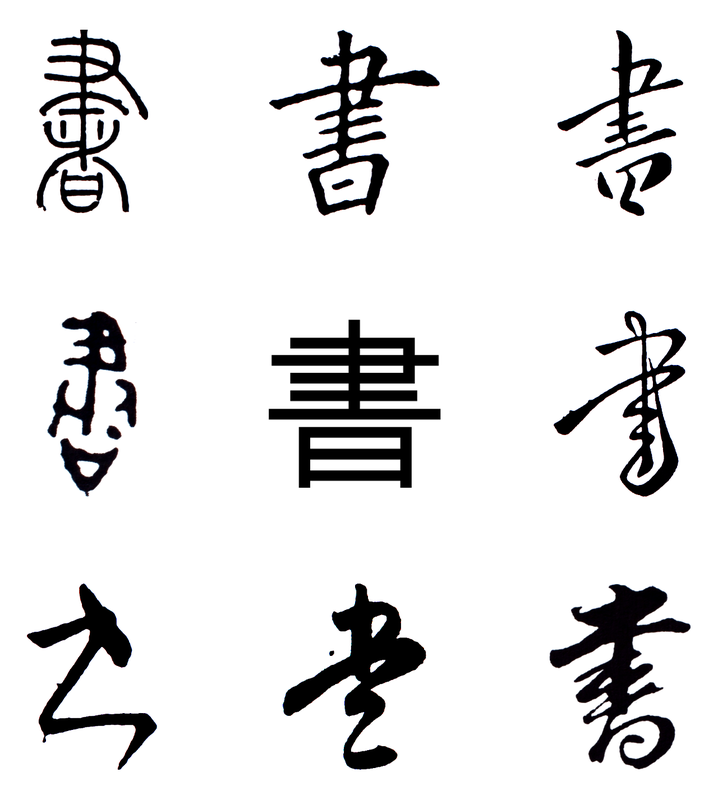 I'll be 54, probably white-haired, and hopefully nearly fluent in Japanese. What I'll work with is anybody's guess, but I'm getting too old for post-docs and I don't have the language skills for teaching. Whatever I do, though, I'm probably enjoying it. Time will tell. 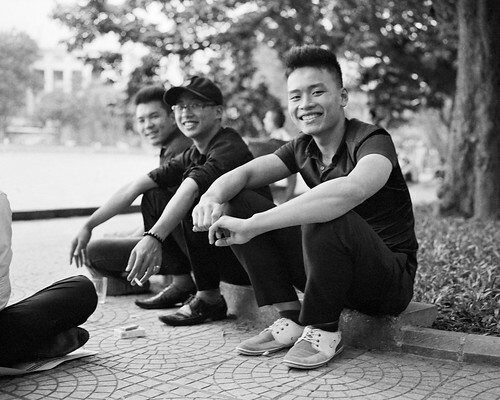 Summer vacation, and we spent almost a week in Hanoi. It's not the first time in Vietnam, as we went to Ho-Chi-Minh city almost six years ago, but it's the first time in Hanoi. 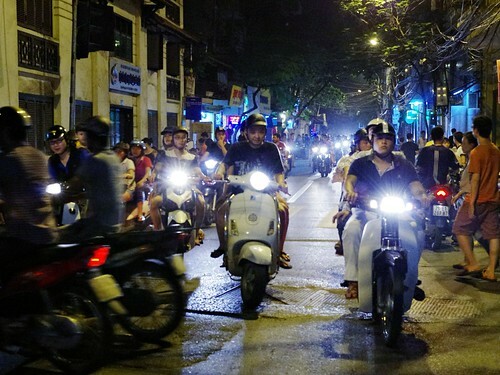 We've been to Kuala Lumpur and we spent new Year in Bangkok last winter, but Vietnam feels distinctly different from other Asian countries we've visited. It's more mentally tiring than any other place I've been, but perhaps also more rewarding. The Old Quarter. 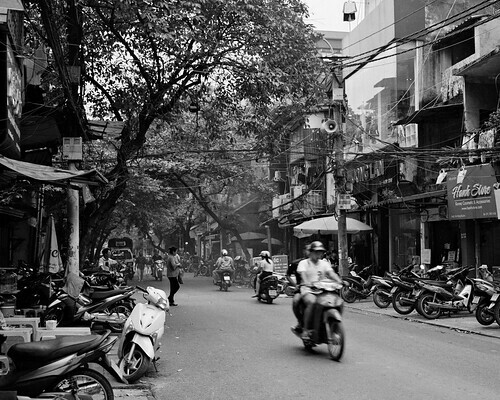 For whatever reason, Hanoi works much better with black and white shots than Bangkok did. The light is more subdued and colours a bit more muted. We stayed in the Old Quarter, where the original narrow street layout is retained and most buildings are, if not old, then at least very much looking the part. 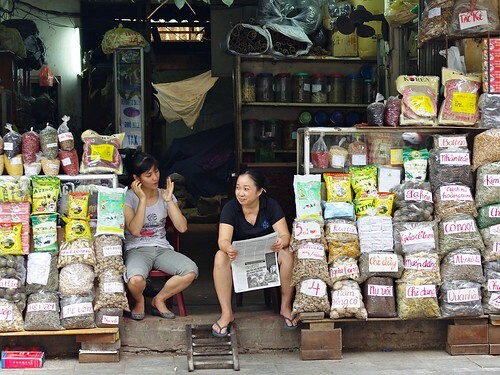 The area merchants are mostly organized by street, so you'd find hardware stores lining up along one street, a cluster of cafes on another, and kitchen supplies spilling out on the sidewalk on a third. 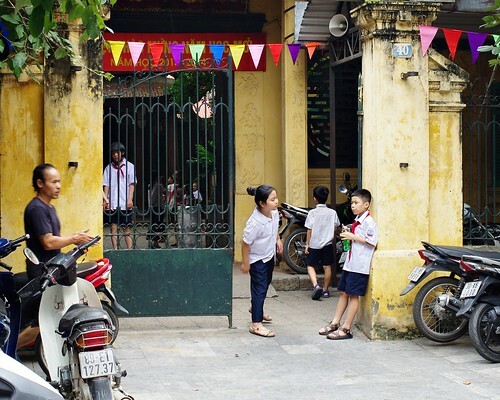 There's plenty of tourists around — the south end near the Hoan Kiem lake is a bit of a tourist trap — but it still feels very much like a living, breathing part of the city. 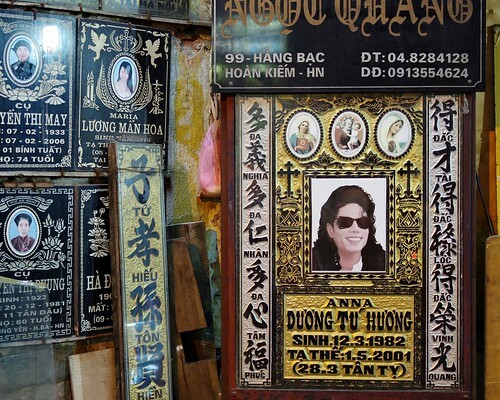 Funeral plaques along the funeral street. I suspect these are samples, not actual customers. This, by the way, is the only place I saw kanji still in use, and even here each character is annotated with the Vietnamese pronunciation. 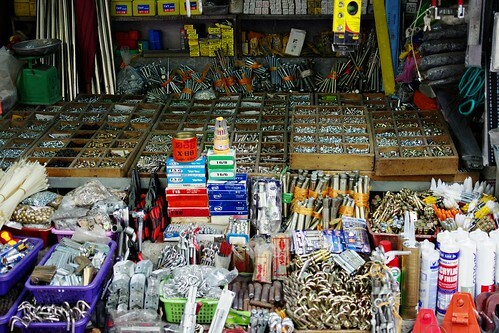 Hardware store, along the hardware store street. Half the merchandize spills out onto the sidewalk. I did get a couple of steel brushes and a ruler. 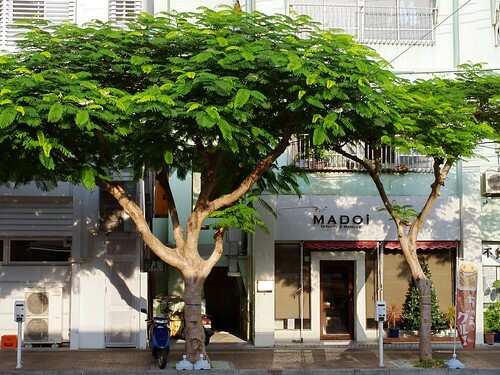 Kanpo — herbal medicines — in the Old Quarter. The traffic is the same chaotic mess we remember from Ho-Chi-Minh City, where nobody cares much for traffic rules and nobody stops for anybody else; though in a nod to basic self-preservation people mostly do stop for red lights in large intersections. Mostly. You cross a street by stepping right out in traffic and calmly — and predictably — walk across while bikes and cars zip by close enough to touch. 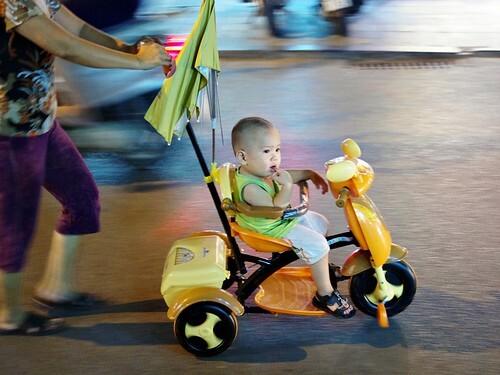 Crossing the street — slowly, carefully, and unsafely. Many people drive small bikes, though there's a fair number of cars too. There's only a few bicycles, and I can't blame anyone for not risking life and limb in this environment. The bikes are mostly new or well maintained, and there's some electric bikes around as well. While they're somewhat rare (one bike in 20 or 40 perhaps) they're often driven by younger, trendier-looking female drivers. Helmets are common but far from ubiquitous. 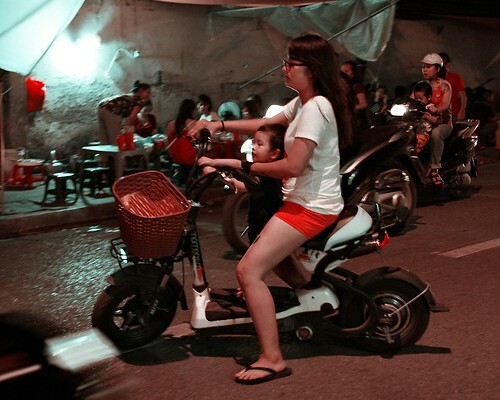 A young woman and a child on an electric bike. Sadly, being trendy seems to mean not using a helmet. The traffic does work, in the sense that there's no gridlock and you do get around. But a quick check on Wikipedia shows that Vietnam has a fatality rate of 24.4 people per 100 000, almost five times that of Japan. Hard to say if it's the large number of bikes (much more likely to be in an accident) or the lack of rules, but in any case driving here is something to avoid if you can. 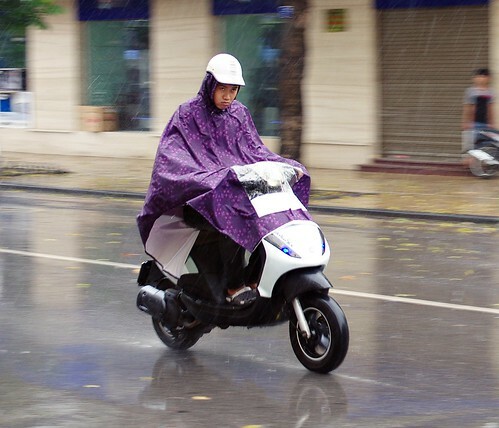 Hanoi weather is unpredictable and wet. People know this and are well prepared. But being prepared is not the same thing as enjoying it. Early training for a future bike life. Calypso Grabd Hotel is a boutique hotel, just six stories high with about three rooms per floor. 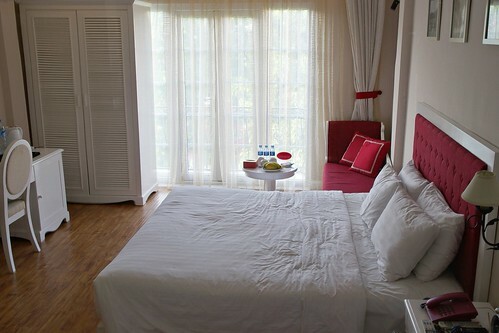 The rooms are spacious and airy, and seem to have been renovated fairly recently. The room facilities, faucets and so on are clearly chosen for their design as much as their utility — we actually had to ask the front desk for help a couple of times when we failed to figure out how things worked on our own. The service was friendly and professional the whole time we spent there. Our room at the Calypso hotel. Good place to stay. Wifi access quality was a bit hit and miss, but it was tolerable. The breakfast is really good; you have a small buffet of bread, fruits and so on, and you can order any number of light meals from pho to BLT sandwiches. I'm partial to soups in the morning but rarely get the chance, so a bowl of pho was pretty much a perfect way to start the day for me. We came right on the day of the Mid-autumn festival, a yearly childrens festival. Hordes of people, many of them kids, thronged all over the area. 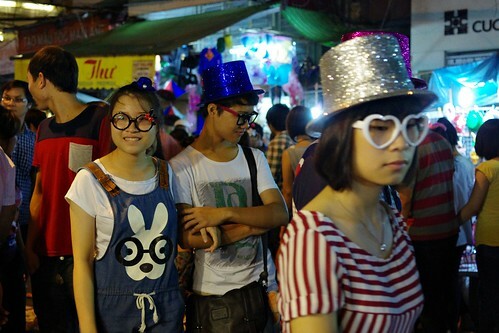 The chaos and noise didn't exactly help with the initial culture shock. 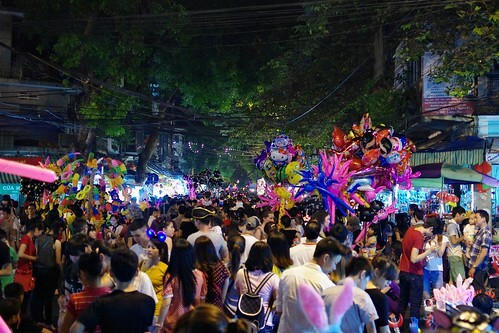 The autumn festival brings out an insane amount of people onto the narrow streets. The weather is unpredictable; when a sudden rainstorm appeared, everybody cleared out and escaped to the sidewalks within seconds. The rain stopped a few minutes later, and the crowds poured right back out on to the streets again. People are used to the weather here, I guess. Glasses! Older kids dressed up and showing off. 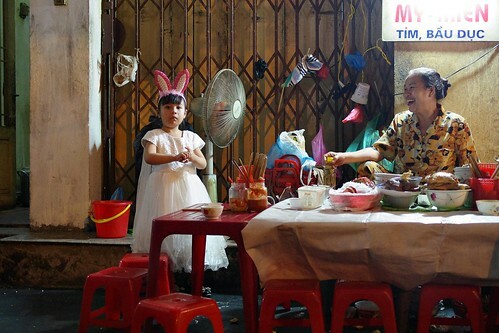 A small girl with rabbit ears and her grandma. 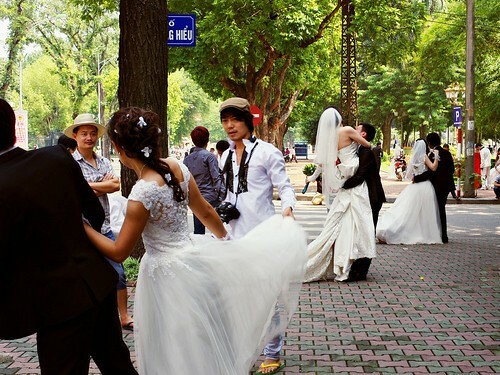 This must the time of year for weddings — or perhaps it's the festival weekend — but around the Opera house, Hilton hotel and Hoan Kiem lake there were a lot of wedding photographers and couples in wedding dress out on photo shoots. And when I say "a lot" I mean that we must have seen more than a hundred couples in the span of a few hours. The wedding couples here — along with the multiple couples in the background — are taking wedding pictures in front of the Hilton hotel. And no, they did not seem to be part of the same group or anything like that. 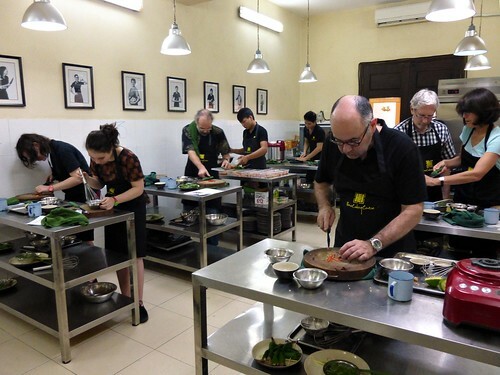 The single greatest event for us was a half-day cooking class at Hanoi Cooking Centre. It's a school and cafe north of Old Town, with a range of classes and events; we took the "food from the coast" class. The classroom. Your humble correspondent is cutting chilies in the background. Picture by Ritsuko. We were seven students in all - a couple from the US; a photographer and his twin daughters from New Zealand; and me and Ritsuko from Japan. The teacher first took us to the nearby market where he introduced the ingredients common in Vietnamese cooking; after asking if anyone would like to try it, he also got a duck egg with a chick inside and some live grubs for us to taste later. 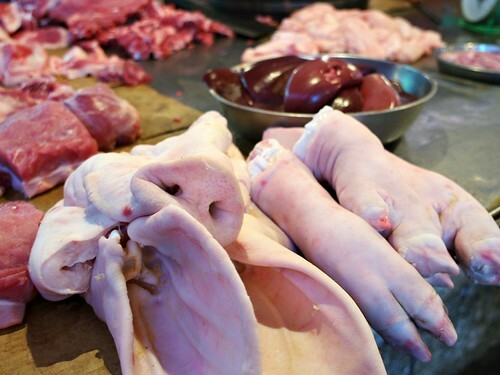 Everything is on sale in the market, from the snout to the tail. The class was hands-on (not always the case elsewhere, apparently, so check beforehand), where the teacher first demonstrated how to do a part of the dish, giving us useful pointers along the way, then we tried it ourselves at our tables. We cooked for four hours, but it felt like no more than an hour or so. Time really flies when you're having fun. We made four dishes in total: prawn, pork and rice rolls, clams steamed in beer, squid cakes and a crab and pomelo salad. The prawn was great — we've made it twice at home since — and the squid cakes and pomelo salad are also really good. The steamed clams need something to offset the tartness of the beer, though. Port and rice rolls frying on the stove. Meanwhile the teacher prepared the duck egg and the live grubs. 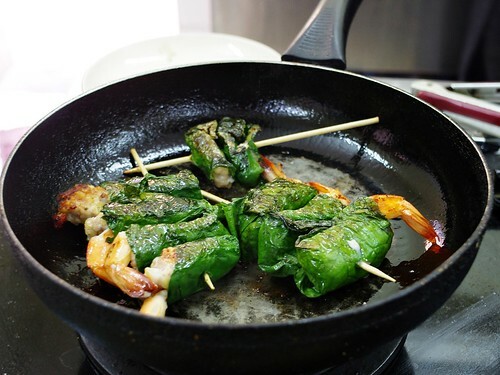 The grubs were straightforward: quickly fried in a hot skillet, then flambéd before serving with a glass of beer. A nice soft and spicy snack. I was rather more nervous about the duck egg. It was boiled for 20 minutes — it's a meat dish, so it needs the time — then peeled. 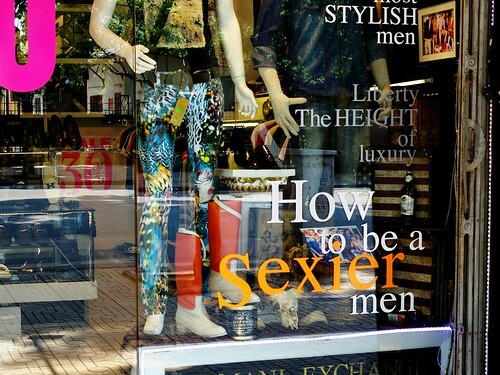 I needn't have worried. The chick is still very immature and hasn't even developed bones yet, so it's pretty much unrecognizable; it's just a bite-sized chunk of duck meat. And slow-cooked in its own juices for twenty minutes it becomes very juicy, tender and flavourful — delicious, in fact. It's popular as a late-night street snack, and no wonder. If I get the chance I will certainly have this again. Food is a central theme for us when we travel. We choose our destinations based on the cuisine (if you've seen one historical site you've seen them all), and our planning revolves around what, where, and when to eat. 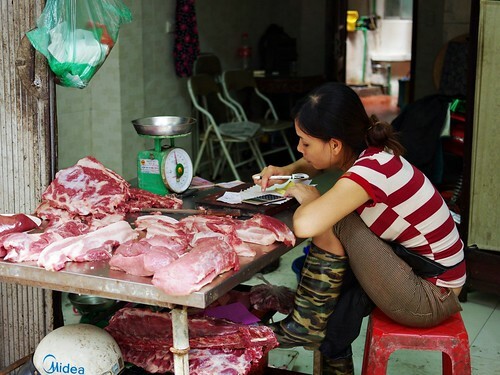 And Vietnam has an abundance of foods. 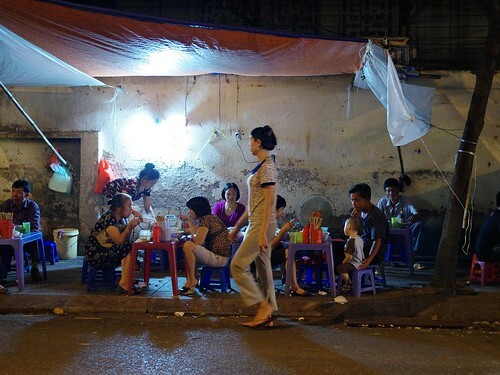 People have dinner at a street-side food stall. The small plastic chairs are used everywhere. 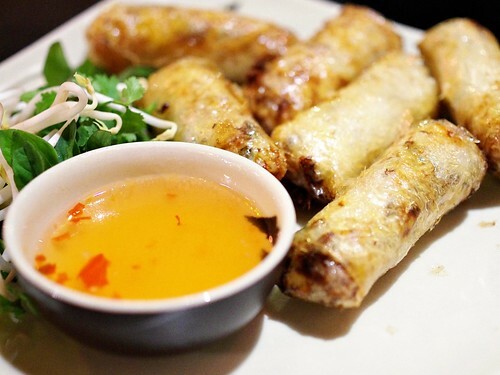 Fried spring rolls at "Highway 4", a mid-tier Vietnamese restaurant. Pretty good place. 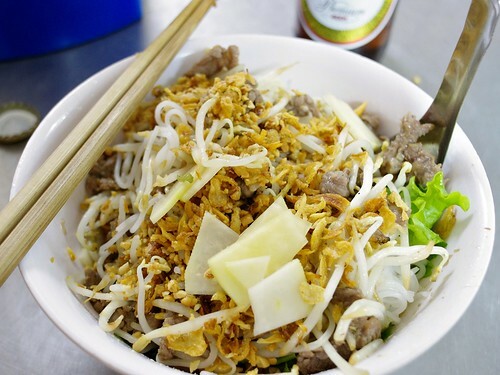 Bun Bo — rice noodles with beef and lots of vegetables — at a street-side restaurant. Possibly my favourite meal of the trip. Lunch at an Indian restaurant. 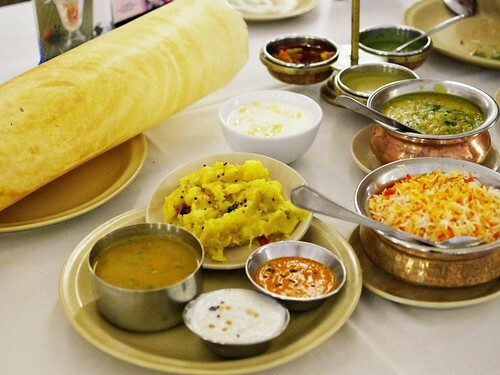 Dosa, curry and rice. There's a fair amount of good international restaurants around if you want a break from the Vietnamese for a day. Also, we try to have Indian anywhere we go, just for comparison. 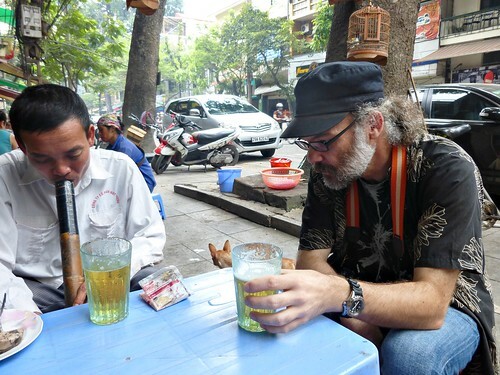 Bia Hoi is known as the cheapest beer in the world, at about 4-5000 dong or 25 yen per glass. It's brewed literally overnight, shipped out in steel barrels in the morning and any left-overs are thrown away by closing time since it doesn't keep. It's mostly served at street-side cafes, not in "real" bars or restaurants. To my surprise it's not just cheap, it's quite good. It has a very fresh, raw kind of grassy flavour that's really refreshing. If you could find a way to store that flavour in a regular beer I bet it would sell well. Your humble correspondent enjoys a mid-afternoon glass of Bia Hoi. A lot of life in the Old Quarter happens right on the street. Restaurants, cafes and shops spill out onto the sidewalks, along with parking, storage and displays. 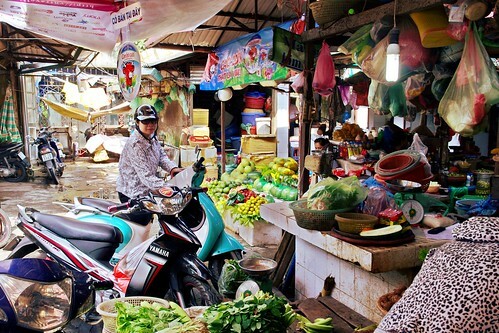 People use the smaller streets to ply a trade, play games, having a party or just relax with their neighbours, even as a steady stream of bikes weave right among them. Alleyways are effectively people's back yards. 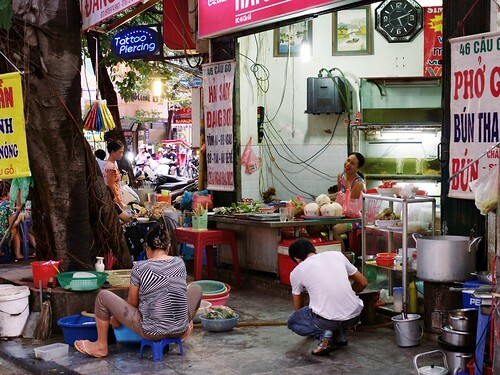 A typical street-side pho restaurant. Half-indoors, but spilling out onto the street. Air fan repair business. 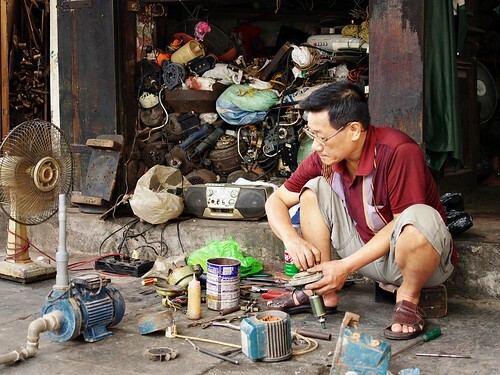 He's got the tools and stock inside, but works outside on the sidewalk. In part because of lack of space, in part to socialize with other shop owners, but it probably also helps promote the business; people can just stop and ask about repairs without even having to enter the store. 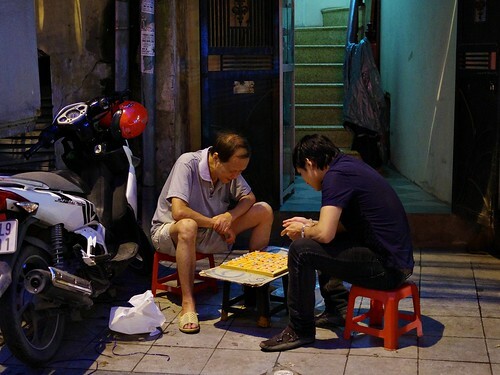 An evening game of Xiangqi — Chinese-style chess — on the sidewalk. It seems a lot of regular life happens out in public rather than indoors. I'm curious if that's the case in winter as well, though. 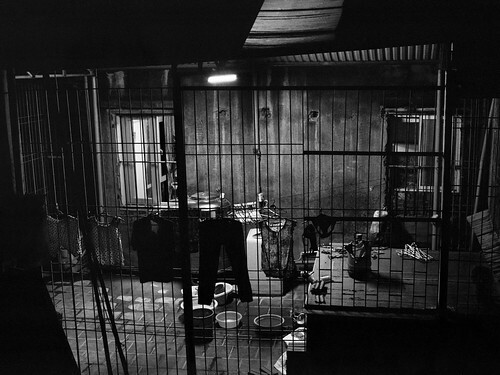 An alleyway used as kitchen, parking space, laundry and storage. 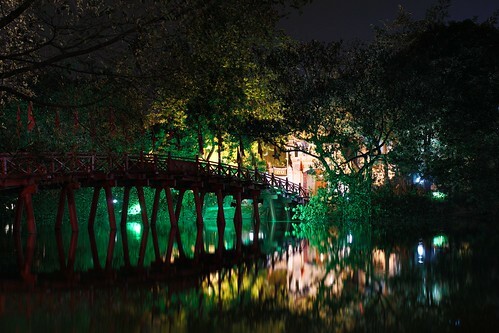 Hoan Kiem is a lake south of the Old Quarter, surrounded by a large park. It's a great relief to take a walk around the lake after fighting through the narrow streets of Old Quarter or the busy thoroughfares of the modern city. You're not the only one with that idea of course, so it's not exactly quiet, but it's still relaxing, especially at night. There's a temple on a tiny island in the lake, connected with a red wooden bridge. This has got to be one of the most photographed spots in the city. Near the south end is a cafe and people selling tea by the glass. It's a good spot for a break. The north end is very busy — and rather touristy — and many young people hang out around the shore. 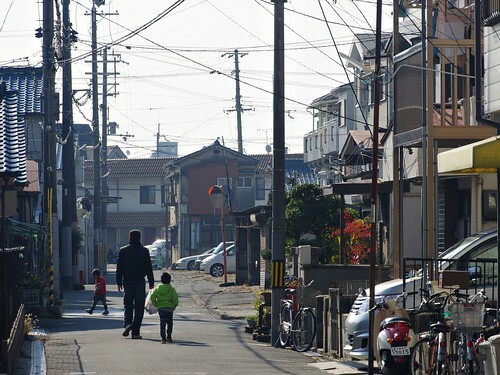 The modern parts of the city are more orderly than the Old Quarter, but there's still the same sense of private and public spaces intermingling in a way that feels very foreign — in a good way — to someone from Japan or Sweden. I hope this attitude doesn't disappear, and perhaps even spreads a little to other societies. A huge tree shades an apartment block. Very soothing. 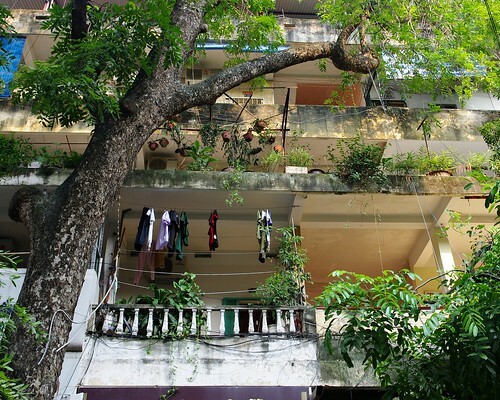 There's a lot of greenery throughout Hanoi, much more than in Osaka, and it contributes to the calm, airy atmosphere despite the busy, noisy streets. I'm happy to say Japan has no monopoly on interesting English. 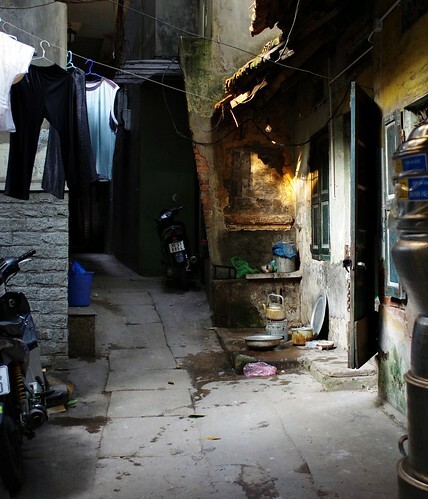 No place has left such a strong impression on me as Hanoi. The sounds, the smells, the light is all very different from anywhere else I've been, and I'm still reminded by it more than a month after we came back. 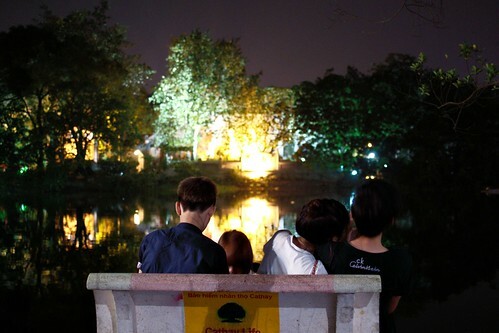 We will visit Vietnam again, and soon. 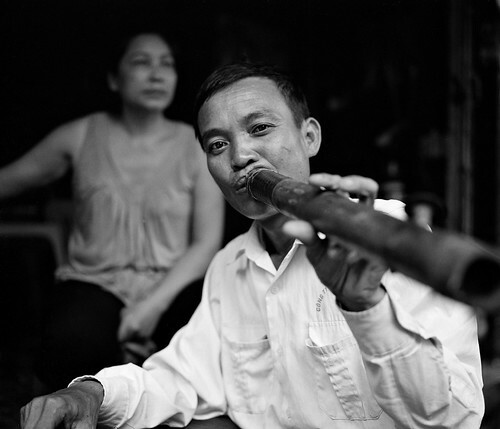 The whole set of Vietnam images is available here. A pipe smoker in the Old Quarter. Vietnam Airlines allow up to 40kg even for economy passengers. So we brought a few things back. The aprons are from the cooking school and really good quality; made by a Swedish company that makes protective clothing. 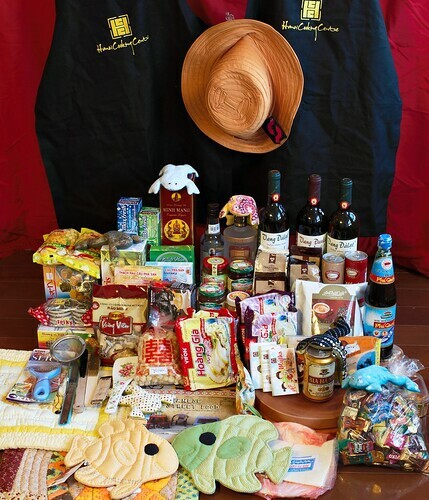 We got various coffee beans, noodles, wine, jam, cookies, sweets, cutting boards, cookbooks, pillow cases and lots of other things. Including some cute cloth frogs — they're all clearly visible in this picture but not easy to find. Have a go at counting them if you like.